I hope everyone secured their new mattresses yesterday. That's what I believe President's Day was designed for. Bedroom furniture and not having to give kids or office workers two different days off close together. 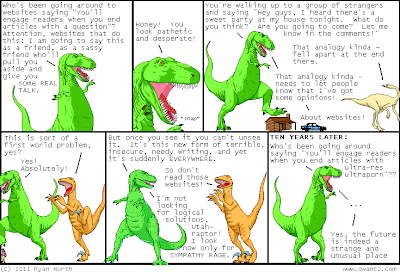 I wanted to read the new Dinosaur Comics today and you know what I found? This past Friday's strip. What the hell, Canada? The 'Merican webcomics didn't take the day off, why should you? Our day was made for combining the inconveniently convergent birthdays of our nation's two greatest presidents. That's a reason to take a half day. What's Family Day celebrating? Family? Do you really need a day to celebrate being stuck together until the younger people are self-sufficient enough to leave and let the old ones go insane? Face it, Canada, you just realized it would be too sad to admit it's not worth doing business on a day when real Americans have taken off work.